MW3 – at least in its campaign incarnation – is a strangely disappointing experience. 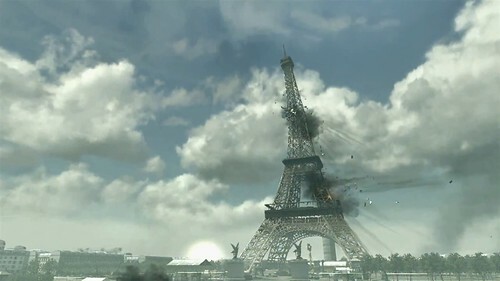 It’s true that you watch as the Eiffel tower gets knocked down by an airstrike [ffwd to 17:45 in linked video] , but otherwise, the game is something of a heads-down run through a series of firefights where volume and intensity of fire replace any pretence at stealth or precision. Given that the original Modern Warfare is primary remembered for ‘All Ghillied Up’ which required the player to navigate the abandoned wreck of the city of Prypiat with care and stealth, this substitution of blind-fire is somewhat strange. Moreover, it has the odd effect of stopping the player from appreciating the levels of detail achieved in the rendering of cities such as New York or, later in the campaign, Berlin. Since players must essentially charge through the rubblescapes firing randomly at barely discernible targets, any appreciation of their environment is lost. This has been a feature of recent First Person Shooters (FPS) with a reviewer of last year’s Medal of Honour noting something similar. Now of course b) is an entirely problematic answer: while I have little time for interminable debates about video games and violence, MW3 is not just a game. It is a cultural event that should be examined for what it tells us about the regimes of representation and affect that characterise the culture it derives from and has so much influence on. Like all cultural artefacts MW3 tells us things about how we see the world and interact with it. Which brings me to objection a): of course this is right in one sense – but MW3 was never supposed to ‘recreate war’. If you wanted to do that you’d need to introduce pain to the experience. Anyone claiming to understand the chaos of war from MW3 needs to seriously think through what they are saying. Of course, it is possible that this kind of visual and somatic chaos does privilege activity over reflection (As Roger Stahl has noted). This may desensitise us to the violence of the war on terror, for example, by foreclosing our more reflective nature. But MW3 does not tell us what it is like to be in Helmand or Basra or Fallujah. So how to make sense of the disappointment? Well, I would draw a parallel with something else that happened this week. In the AFPAK theatre a NATO airstrike killed up to 28 Pakistani border personnel. This has had serious repercussions with Pakistan seeing the strike as a violation of sovereignty and a breach the understandings that allow US and NATO operations against Taliban fighters in the contested terrain of the Afghanistan-Pakistan border region. Pakistan has responded by ejecting the US from an airbase used to launch drones. The strike on the Pakistan border exposes very clearly the fallacy of the supposed precision targeting of the war on terror. The idea of precision is a product of 2 dynamics: on the one hand the development of sophisticated information technology systems that render battlespace in real time, thus giving the impression that targets can be hit with accuracy; and on the other hand the representation of warfighting through footage of ‘successful’ drone strikes on clearly identifiable targets. The latter representations frame civilian understandings of warfighting giving the impression that improved IT has led to an accurate, precise warfighting. However, the loss of Pakistani border personnel shows us that such precision is a fiction born of cultural expectation (surely machines don’t get things wrong) and representation (we have been shown precise strikes, so all of them must be like this). Of course, the exposure of the fiction of precision has been underway for a while now – at least since the US dropped bombs on Afghan wedding parties. As such, we have been retreating from the fiction of precision for a while now: understanding, if only tacitly, that war is not precise. I would say that MW3 mirrors this retreat from precision well. There is little that is careful or deliberate about any of the single player campaign in MW3 – even the sniping scenes end in outlandish explosions. And whether we have time to examine the landscape is neither here nor there if all we trying to achieve is ‘good effect on target’. I am not suggesting some sort of conspiracy by game designers to desensitise us to a lack of precision. That would be a long way from the truth. But I am suggesting that we should look at cultural artefacts such as MW3 and ask whether they play a role in both reflecting and influencing a culture that has been retreating from precision in its overseas campaigns for nearly 10 years. The question, of course, is what can be done about the retreat from precision given the impunity with which drone strikes are proceeding. This entry was posted on Tuesday, November 29th, 2011 at 14:05	and is filed under Comment. You can follow any responses to this entry through the RSS 2.0 feed. Both comments and pings are currently closed.